Patellar Tendonitis, also known as "Jumper's Knee", describes pain around the patella, or knee cap. This condition is common in sports involving jumping, as well as running, biking, skiing or climbing. 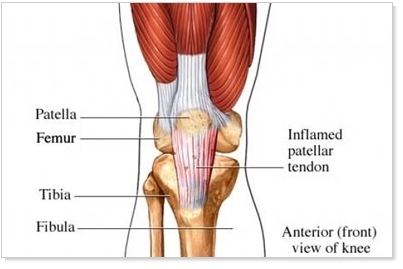 The patellar tendon connects the quadriceps muscle to the patella and then the patella to the tibia, or shin bone. When the quadriceps muscle contracts, the lower leg extends through the patella tendon. Forceful contraction of the quadriceps muscle is needed for power in activities that involve kicking, jumping or explosion, and can lead to Patellar Tendonitis. The first signs of Jumper's Knee are pain and stiffness. Pain can be sharp during jumping, landing or with certain lateral motions. Pain is usually dull and the knee feels stiff after activity. The pain can usually be localized to an exact location, and usually occurs between the patella (knee cap) and where the tendon attaches to the tibia (shin bone). Increasing activity or intensity of exercise can lead to Patellar Tendonitis. It can also be an overuse injury in endurance athletes. Playing more basketball, jumping rope, lifting weights or trail running can cause Patellar Tendonitis. The repetitive nature of running or cycling can cause small tears in the tendon which do not heal in between activity sessions. The increased stress and small tears can eventually lead to tendonitis. Although Patellar Tendonitis is common when activity or intensity is increased, there are other causes for Jumper's Knee. Increased body weights, Patella Alta and muscular imbalance can also cause Patellar Tendonitis. A muscle imbalance can cause the patella to pull to one side, rubbing against the bone instead of traveling smoothly across the patella fossa. This is not unusual in those who have both chondromalacia patella and patellar tendonitis. Ice and rest at home will speed healing of the patellar tendon. Decreasing intensity and frequency of exercise, as well as limiting explosion, jumping and climbing can resolve pain and provide relief for this condition. Runners should avoid trails and hills, and cyclists may need to have a bike fitting or evaluate their position on the bike. Increasing pain or pain that continues for several weeks after rest is a cause for concern. Your provider can usual diagnose the problem with a simple exam, but if the provider is concerned about internal knee damage, further tests may be required. Your provider will recommend exercises and stretches to correct imbalances and prevent Patellar Tendonitis from recurring. A patellar tendon strap decreases pressure on the patella, allowing a faster recovery. In general, treatment will focus on lowering inflammation, managing muscle spasms and decreasing pain. When returning to physical activity, a gradual increase of intensity and frequency is recommended. Less than 10% increase in the amount of exercise per week is recommended, as well as ice and rest, to prevent most overuse injuries. Mild cases of Patellar Tendonitis can be treated easily by an experienced provider. Cases that are more severe will require longer and more involved treatment, especially in cases where the tendon is actually torn. It's best to seek treatment early, before mild cases become severe injuries.